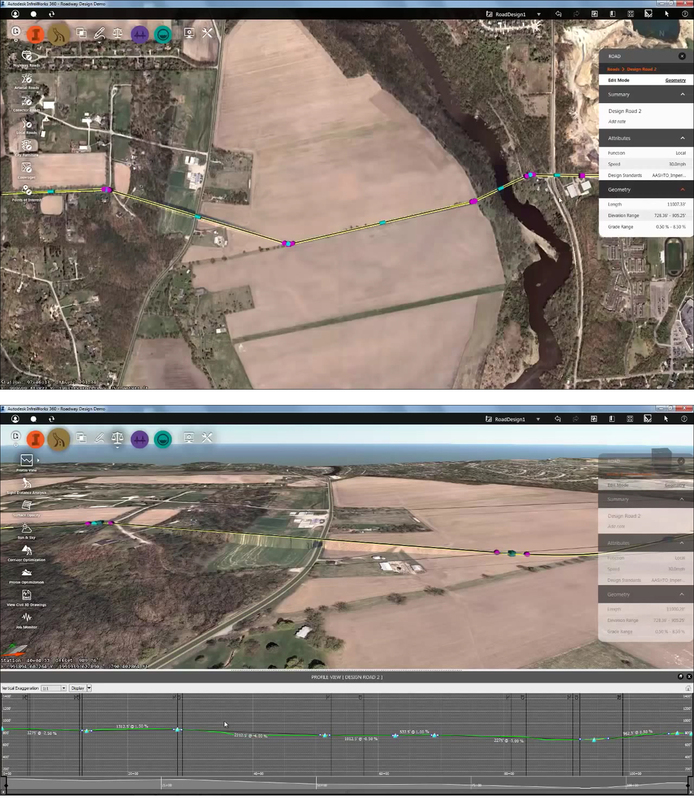 A couple of weeks ago, I visited the Midwest University conference in Minnesota, where, among other events, I attended a class on “Advanced InfraWorks – 360 Modules and Features” presented by Eric Chappell of Autodesk. While I have written about InfraWorks in the context of two recent articles on infrastructure design (“Extending BIM to Infrastructure” and “High Speed Rail and BIM”) and had a broad understanding of the application and its capabilities, I hadn’t really had the opportunity to get into the details and see how exactly it worked. Being an architect by background, I was very well acquainted with the nitty-gritties of all the architectural BIM applications, and I figured that attending the InfraWorks class would provide me with the chance to learn a little more about it. I had not expected to be wowed, but I was. For those who are not very familiar with the application, it is essentially a preliminary design tool for infrastructure, but one that works with large-scale, data-rich regional and city models—which can be created on the fly from existing open-source GIS and mapping data—letting you conceptualize infrastructure ideas right in the context of the environments in which they are to be located. Thus, roads, bridges, railway corridors, and so on, can be sketched out in 3D exactly where they will actually be. Illustrations of this very impressive capability were shown in both the AECbytes articles mentioned above, and I found it hardly surprising that InfraWorks was gaining momentum in several leading global infrastructure design firms including Multiconsult AS and Parsons Brinckerhoff. 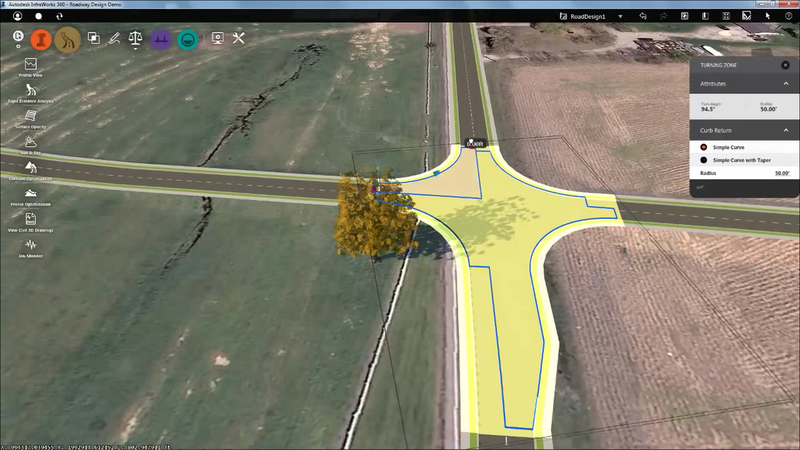 Getting back to what so impressed me so much about InfraWorks in the class I attended, it was the “smarts” of the application underlying the actual infrastructure modeling tools that were being demonstrated. For example, if you are sketching a road, the application takes into account the terrain—from the 3D model of the region—over which the road is being created and automatically creates the profile, elevation, and slopes for the road to be constructed along the sketched path. All of these aspects, including the road path, the profile, the elevation, and the slopes connecting the road to the surrounding ground, can be modified by the user, and the road design is automatically configured, while still maintaining the “correctness” and “buildability” of the road in question. Based on the desired width of the road, the number of lanes is automatically calculated and indicated with lane markers. Similar smarts are applied in the design of intersections—based on the angle at which the roads intersect and the area that is designated, lanes are automatically cleaned up and turning lanes are created. As before, any of these aspects can be changed by the user and the intersection is updated automatically. Taking one more example—which I actually found the most impressive and which was the trigger for this article—if you are sketching out a bridge in InfraWorks, it is automatically modeled with the supports necessary to make it buildable. Or to put it in the correct engineering terminology, the major components of the bridge such as the deck, superstructure (girders) and substructure (piers and abutments) are automatically created, sized, and configured based on based on its span, width, and other factors. As with roads, each of these individual components can be modified as required, and if necessary, the bridge will be redesigned and reconfigured to maintain its structural integrity. Another very impressive feature is the automatic creation of the bridge itself— if you sketch a road that crosses a body of water or a ravine, a bridge will be created automatically for that span. While it seems almost like magic to sketch out a road or a bridge and see it being automatically created with its accompanying components, I learned that what actually underlies the capabilities of InfraWorks are “sound engineering principles.” Thus, what you see are not just “pretty pictures,” or to put it more accurately in this context, “pretty models.” All the related and necessary supporting elements that are automatically created when a main infrastructure element such as a road or a bridge is sketched are laid out and proportioned using engineering based analytics that can be controlled by the user. The fact that InfraWorks is not a detailed engineering tool, and most users would take the resultant design to an application like AutoCAD Civil 3D to fine-tune it, does not detract from the impressive capability of InfraWorks to create that design in the first place—and with minimal input from the user. An “InfraWorks” for Building Design? This naturally begs the question: Well, why don’t we have something like this for building design? Some might think that we do. After all, BIM was developed for building design first—and it’s been around for several years. It has only just recently started being applied to infrastructure design. How then can infrastructure have a better BIM than building design? Actually, it does. And mystifyingly, we still do not have a tool like InfraWorks for building design. In conclusion, ArchiCAD 16 has some critical new capabilities which help to give it an edge over competing BIM applications in some respects. However, it is not any closer than other BIM applications to dramatically making BIM more intelligent, where AEC professionals do not need to painstakingly model every single detail of the building but provide only high-level ideas and can then rely on the application’s smarts to figure out its details. As I pointed out towards the end of my BIM Evaluation Study Report, “compared to other fields such as EDA (electronic design automation, or CAD for the computer chip industry) where the lower level design tasks have almost entirely been automated, BIM is still a relatively ‘dumb’ technology where the user is forced to model everything in the building.” By and large, current BIM applications, including ArchiCAD, have not made any advances along this front. It would be great if Graphisoft could apply its strong technological skills towards dramatically improving BIM, where the equivalent of a “napkin sketch” can be the basis of inferring and automatically modeling much of the building. I didn’t expand upon this idea at that time because it seemed as though architects were not hankering for such capabilities—they seemed to be satisfied with the incremental updates to the BIM applications that they were getting, which made it possible for them to create increasingly more detailed building models, along with better engineering, construction, and collaboration capabilities. Also, I didn’t really think the technology was there yet. Because what we are essentially talking about here is using “expert systems” (also known as knowledge-based systems) for design—a familiar concept in academia and research, but not very common in professional practice and commercial tool development. Or so I thought. It’s only when I saw this capability implemented in InfraWorks—the use of “rules” to automatically design supporting systems and elements for a desired intent—did I realize that I was mistaken. I’m not sure how the InfraWorks development team refers to the “automatic inferencing and design” capability that it has developed, but the fact that it has been implemented in a commercial tool—and not just in a research project—shows that it can be developed and implemented for building design as well. Since InfraWorks is an Autodesk product, does this mean that Autodesk has a better shot at developing a smarter tool for building design than other developers? I don’t think so, especially considering the fact that InfraWorks was not developed by Autodesk from the ground up but came from the LandXplorer product that Autodesk acquired in 2008. Thus, it is very much a wide open field, a challenge that any developer, established or new, could take on. Of course, this task would be easier for the existing developers of BIM applications as they already have the necessary domain knowledge and expertise to create the “rules” that would be needed to drive the system. Thus, companies like Autodesk, Bentley, Graphisoft, Vectorworks, Allplan, and others undoubtedly have a good first shot. However, they need to first accept that the current tools they have developed are for detailed building design and not for conceptual design. Any tool in which you have to model walls, a floor, and a ceiling to create a space is NOT a conceptual building design tool. Also, rule-based design is not the same as generative design, so Autodesk cannot position Dynamo and Bentley cannot position recently acquired SiteOPS as examples of smart building design tools. They’re not. An application like SketchUp would actually be a great candidate, as it already has the right idea and the right interface for a smart conceptual design tool—except that it is still a generic 3D modeling tool and not specific to building design. One of the earliest features of the application—which wowed everyone at the AIA 2001 National Convention and Expo where it was first introduced—and which is still an integral part of the application, making it tremendously intuitive and easy to use, is smart “inferencing” that minimizes the input needed from the user to perform modeling operations. This ability to quickly get in and start sculpting forms right away might seem deceptively simple, but it actually comes from some very complex inference algorithms that constantly look for alignments, snapping, and directions based on the mouse movements of the user. Imagine if SketchUp had this kind of smart inferencing for building design where we could sketch out a design and the application could use it to automatically create a structurally sound, constructable building? Perhaps now that SketchUp belongs to Trimble, it will work on developing this capability in a future release? And, of course, we should not discount the possibility of a brand-new application being developed by a smaller technology company or a start-up, which can approach the problem from a fresh perspective and deploy some “out of the box” thinking about architectural design tools. It’s been over a decade since we had some really cool, innovative tools developed for architects—similar to how SketchUp and Revit themselves, prior to their respective acquisitions, dazzled audiences when they were first demonstrated by the startup companies that had developed them—and the timing couldn’t be better for us to see some “new blood” in the AEC technology space. Too much of the discourse on current building design technology has moved over to the practical details— multi-disciplinary collaboration, coordination, constructability, estimation, field logistics, site monitoring, and so on. All of these are undoubtedly crucial, and the AEC technology industry is doing well to continue working on them to make it easier for the average AEC professional—who is responsible for actually building these buildings—to do their tasks more easily and efficiently. At the same time, we need to sometimes revisit the beginning and ask: Is there nothing else we can do to make the process of conceptualizing a building smarter, more intuitive, more fun? Why can’t we simply be able to sketch out a building design—say a floor plan or a façade—and automatically get a fully detailed, structurally sound, constructable BIM without actually having to model every bit of it? Is this too much to ask for? I hope not. If it can be done for infrastructure design, why not for building design? BIM for building design is starting to get a bit jaded from a technology perspective. What we need right now is a game-changer to make it exciting again. Note: While this article is not intended to be about InfraWorks except to highlight some of its capabilities as an example of what might be possible for building design, it should be helpful to readers to see illustrations of these features, shown below. 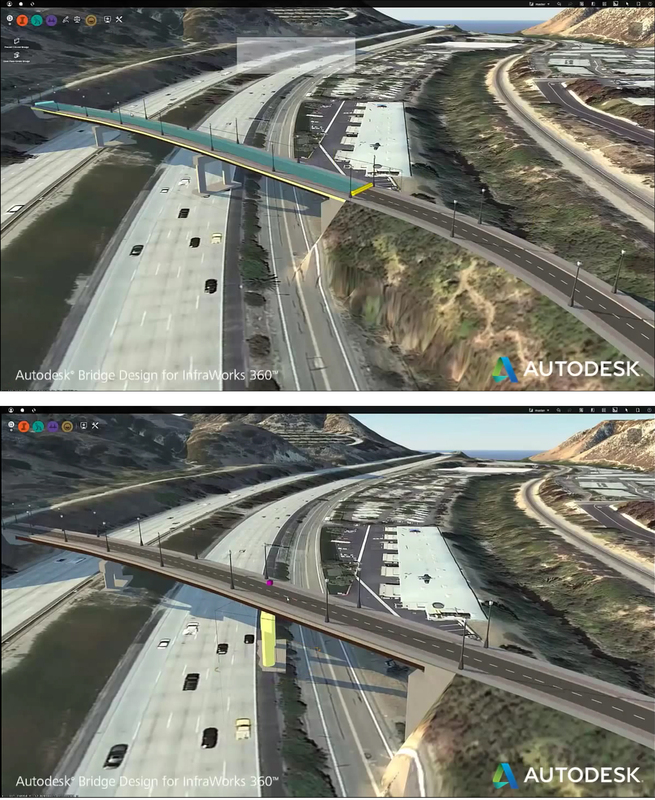 All of these were generated from the video, Autodesk Bridge Design for InfraWorks 360: Overview. Also, the capabilities described in this article are part of specialized vertical modules for road and bridge design that are available for InfraWorks 360. Figure 1. Sketching a road on a terrain (top image) automatically creates its elevation, profile, and side slopes (lower image). 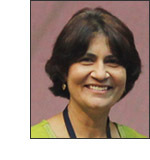 The profile can be edited in a separate window, as shown. Figure 2. Additional turning lanes can be added to a road intersection by a simple editing operation to increase the area of the intersection. Figure 3. Designating a part of a road as a bridge automatically creates the deck, girders, and other structural components (top image), which can then be modified as required (lower image).